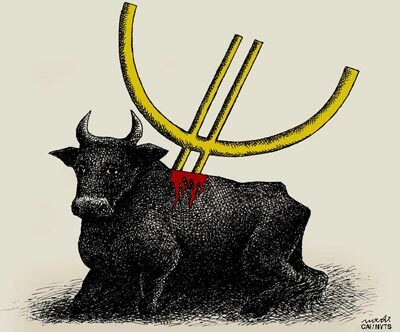 (Image: CartoonArts International / New York Times Syndicate)The Spanish bailout was agreed to this month, but with so many restrictions and indications that it isn’t the start of something bigger that the markets were, to say the least, not happy. I also think it’s especially interesting to see just how much the recent rally in Irish bonds reflected hopes that the country’s bank rescue could be “Europeanized”; once those hopes were dashed, it all went away. So when does the full-blown crisis start? Hard to say. At least some indicators say that the market expects the worst, but not right away. And God, do I wish Rudi were still with us. He would have been in his element, and would have been a really important voice for sanity. A recent article in Business Insider, “The World Is Experiencing the Opposite of a Sovereign Debt Crisis,” was, I thought at first, just saying the obvious. Then I looked at the comments. In the article, published online on July 15, the deputy editor Joe Weisenthal makes the well-known point that aside from the experiences of certain euro area countries, yields on sovereign debt have plunged since 2007; investors are rushing to buy sovereign debt, not fleeing it. I was a bit surprised by his description of this insight as being non-mainstream — I guess it depends on your definition of mainstream. But surely the notion that what we have is largely a process of private-sector deleveraging, with government deficits the consequence of this process, and interest rates low because we have an excess of desired saving, is pretty widespread (and backed by a lot of empirical evidence). And there’s also a lot of discussion, which I’m ambivalent about, concerning the supposed shortage of safe assets. This is coming from bank research departments as well as academics, it’s a frequent topic on the Financial Times’s Alphaville blog, and so on. So Mr. Weisenthal didn’t seem to me to be saying anything radical. But those comments! It’s not just that the commenters disagree; they seem to regard Mr. Weisenthal as some kind of space alien. They consider it just crazy and laughable to suggest that we aren’t facing an immense crisis of public deficits with Zimbabwe-style inflation just around the corner. And I know that it isn’t just the Business Insider commenters; pretty obviously, the great majority of people who spend their time watching financial news and reading financial blogs operate in an intellectual universe where the surpassing evil of deficits and the imminence of vast inflation are just what everyone knows; year after year of low interest rates and failure of inflation to take off — which must have cost people who believe this stuff a lot of money — makes no dent in that certainty. It’s an interesting phenomenon. I don’t think it’s just a product of the usual propaganda efforts from the right. There’s something about the “Deficits! Inflation!” story that evidently resonates with a lot of people no matter how often and how badly the worldview fails in practice — and is also completely resistant to attempts to point out that things must add up, that everyone can’t simultaneously spend less than their income. What’s going on? I have some ideas, which I’ll try to flesh out in the future. And of course there’s a self-reinforcing character to this mindset: because it’s what consumers of financial media want to hear, purveyors of content respond by telling them this stuff, to such an extent that they’re shocked and mystified when someone like Mr. Weisenthal points out that it just ain’t so. Anyway, I think it’s important to get a grip on this phenomenon, which is one of the factors distorting our policy debate.